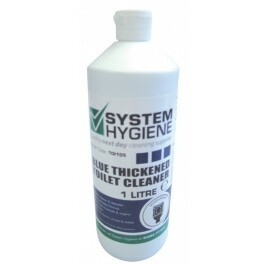 System Hygiene RTU Blue Thickened Toilet Cleaner is a tough working and easy to use, stainless steel safe, toilet cleaner and descaler. The viscous formula clings longer than regular toilet cleaners for a more thorough cleaning action. The concentrated formulation liquid lavatory cleaner also effectively removes limescale and organic deposits, whilst also being excellent for cleaning and descaling washroom areas. Can be safely used on all ceramic and stainless steel urinals and toilets. Equally efficient as a descaler, freshener or a cleaner. Contains a modern bouquet fragrance. Blended with a pH of 1. Full case pack size - 12 x 1ltrs. REGULAR CLEANING: Apply the toilet cleaner evenly above the water line and around the bowls rim. Leave for approximatley 10-15 minutes before flushing the toilet to rinse. URINALS: Apply the toilet cleaner directly to the surface of the urinal with a mop applicator and agitate as necessary to remove any stubborn stains. Leave to flush and rinse out the applicator. HARD SURFACES: Dilute 1 part to 40 parts cold or hand hot water (125ml per 5Ltr). Wash the applicable surface with this solution. Rinse thoroughly with fresh, clean water. Please Note: Do not use on any acid sensitive surfaces such as marble, terrazzo, chrome or enamel. Do not leave any neat material in prolonged contact; always rinse off after use.